Treetec provides tree services, arboricultural reports, tree hazard assessments / surveys, inspections for planning applications and related services, based in Melbourne some services provided Australia wide, please email or call us with any questions or to arrange a quote. For a summary of our services please see our home page. Below is a more detailed description of what an arborist is, services provided within the amenity tree industry and other related information with particular reference to Melbourne and Victoria. An arborist is engaged in the field of Arboriculture which is primarily concerned with the selection, planting, and care of trees and woody plants (Harris, Clark & Matheny 2004). In the past an arborist was more closely associated with establishing and caring for trees however the amenity tree industry, particularly in Australia, is now primarily involved with caring for trees in the urban environment and the majority of the work performed by commercial arborists is tree care, pruning and tree removal. The definition for 'arborist' has become problematic because many operators who specialise in removing trees or tree lopping are using the label 'Arborist', often without the underlying knowledge of tree biology. Arboriculture is a broad field with a range of specializations. What services does an arborist provide? Arborist services such as diagnosis, tree management plans, assessments and the various reports relating to such. Council requirements, in Melbourne particularly, regarding tree management have created the need for an arborist assessment and report for many planning applications. Also the duty of care requirements for owners or managers of tree populations at schools, parks and public areas has meant that ongoing hazard tree assessments are required. These inspections will provide the managers of the trees with a list of hazardous trees, degree of risk and management options for reducing that risk. The primary focus of a utility arborist is reducing or eliminating contact between vegetation and power lines. Trees are responsible for most power outages and can trigger fires with catastrophic consequences. Although a utility arborist should have an understanding of tree biology and care, the focus will always be on maintaining clearances from infrastructure with tree health and form as a secondary concern. Tree care, pruning and tree removal is the largest sector within arboriculture, Commercial arborists undertake the hands on work relating to selecting, planting, transplanting, caring for and removing trees and tree stumps. Many small operators within this field (pruning and tree removal) market themselves as Tree Loppers. Because of the unique set of skills related to canopy access / tree access there are a number of related career opportunities available to a qualified arborist such as seed collection, ecology and habitat work and canopy access for hardware installations such as lights or fauna monitoring / bridges. To Lop is to 'cut off', within arboriculture it is considered a disparaging term and is used to describe the cutting of a tree with little or no regard for the plants natural defence systems. Therefore a Tree Lopper is often someone without the underlying training and knowledge required to properly care for trees. Of course, if it is tree removal work, then this may not matter except where nearby trees might be impacted. When pruning a tree the choice is between lopping and natural target pruning. Topping is the lopping of the central leader, it usually results in significant decay in the main trunk with vigorous new shoots competing for apical dominance, the new shoots quickly become tall and will be poorly attached leading to a hazardous situation. Most good arborists will only lop or top a tree in exceptional circumstances and often there are alternative tree management options the arborist can suggest. How do I find a good arborist in Melbourne? Of course we would suggest Treetec and our consulting arborists for a range of tree services, reports, pest treatment such as Elm Leaf Beetle control, care of significant heritage trees and risk related work, however Melbourne is fortunate to have a strong arboricultural community with many good practitioners. Finding an arborist is done through the usual channels of web searches, business listings and referrals. What qualifications should an arborist have? Arboriculture and arborists are not regulated in the way electricians, plumbers or forklift operators are, there's currently no legal requirement to hold a licence or certificate of competency. There is a requirement under Workplace Health & Safety (WHS) legislation to ensure all people in the workplace are given adequate training, supervision and instruction but there is almost no policing of these requirements. This is the reason there are so many under-trained tree lopping companies. What recourse do you have if you are not happy with a tree related service in Melbourne / Victoria? If there is an issue with a tree contractor or arborist in Victoria and you have been unable to resolve the problem through a direct approach then consumers are protected under Consumer Protection legislation and Consumer Affairs would be a good place to start. There are a range of Arboricultural industry organisations / associations and many companies are members, there is nearly always a component of building professionalism within the industry and the organisation can bring some pressure to bear on members to do the 'right thing'. When all else fails there is VCAT and the courts. 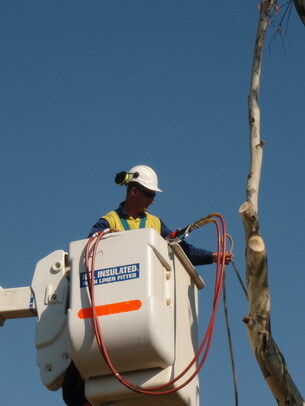 There have been a number of cases of arborists in Melbourne (and elsewhere) cutting down the wrong tree by mistake and there is simply no coming back from this, so when dealing with companies that provide tree services be very clear about the exact scope of the works and what is expected in terms of price, cleanup, acceptable levels of damage and timing. A much more common problem is poor work such as spurring of trees being retained, flush cutting, leaving stubs, over pruning or wounding. Trees don't heal like mammals, once you make a bark tear, wound the cambium, put 300 spike holes in a tree or flush cut a branch (cutting beyond the branch collar and into the trunk wood), then there is no fix, these are all serious wounds that don't heal, the tree will try and compartmentalise the area (close it off) so that decay doesn't spread through the tree, the tree will also try to grow over the wound for structural reasons however the wound is permanent and that area of the tree will be shut down in terms of respiration, transporting water etc. These types of mistakes are made very commonly and are usually due to poor knowledge on the arborists (Loppers) part. The client usually won't understand the implications of these actions on the tree and trees are long lived structures that react in slow motion, you have to think 'tree time' not human time. There is an Australian Standard on Pruning of Amenity Trees (AS 4373-2007) it covers the issues above and many others so if you engage an arborist make sure they are aware of this document and are working to it, it would be a good idea to ask to see their copy. How do you become an arborist? Normally a basic level of training is undertaken on the job and / or combined with specialist short courses such as chain saw use, tree climbing, aerial rescue, pruning, tree felling, woodchipper operation etc. (Treetec provide Chainsaw training and some tailored training) To move into specialist fields, lead a crew and operate a business an arborist should undertake an absolute minimum of Certificate 3 in Horticulture (Arboriculture) this is the minimum level for an unsupervised arborist. When preparing tree reports or undertaking tree hazard assessments the minimum accepted level is Certificate 4. One can go on and do degree level studies within arboriculture. Treetec recommends as a first step to do the basic short courses in Chain Saw (Operate and Maintain Chainsaws), Woodchipper operation, Tree Climbing / aerial rescue and pruning. If these units are done while getting in the field tree services experience the skills enable you to safely work within a tree crew and gradually gain the experience required to assess your suitability for the tree industry. If you are suitable for the rigours of the tree industry we STRONGLY advise that you undertake the full arboricultural training course at a recognised institution such as NMIT in Fairfield. How dangerous is a career in arboriculture? It is not clear exactly how dangerous it is to be an arborist due to the lack of reliable data related to injuries and fatalities however it would be difficult to argue that it is not one of, if not the most, dangerous occupations. There continues to be an ongoing series of incidents, injuries, near misses and fatalities reported within the tree industry, and a lot of incidents that are not reported. Unfortunately the bulk of work for arborists involves working at height with a chainsaw around a structure (the tree) that is not tested or rated whilst hanging from a climbing rope about 13mm thick. This enormous level of risk is managed in various ways however it only takes a little mistake or moment of complacency from even the best arborist and the consequences can be fatal. 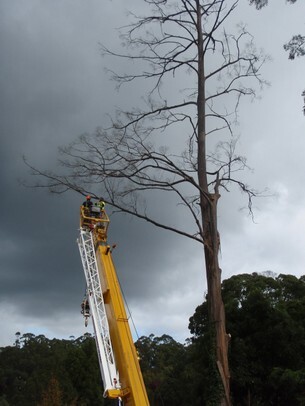 Surprisingly many arborists or tree operators are injured not whilst climbing but while working on the ground with chippers, chainsaws etc in an unforgiving environment. Only recently a groundsperson was killed when he was struck in the neck by a rope that had been inadverently fed into the wood chipper. The other less visible risk is that tree climbing and related activities is very hard on the body, it usually takes some years however the damage to knees, elbows, backs and feet is significant and has forced many operators to change the structure of their business or move out of the tree industry completely. Currently there is no licence required to be an arborist, Occupational Health and Safety laws require, electricians, winch operators, dogmen (rigging) and forklift drivers to have a licence but as yet, not arborists. Tree arborists have slipped under the radar for many years most likely due to the relatively small number of people employed within the industry, the last 15 years has seen a significant growth in the number of tree loppers, arborists and arboricultural companies, this has increased the number of injuries and deaths and consequently the tree services industry is now coming under much closer scrutiny, particularly in Melbourne / Victoria from Worksafe and Safe Work Australia. All workers are meant to be protected under Occupational Health and Safety Laws and this includes the requirement for appropriate training and OHS Systems and documentation. Treetec provides comprehensive OHS systems and provides risk management consulting within the industry. What is the best arborist training in Melbourne? Treetec runs regular chainsaw courses for companies and individuals. An arborist should undertake a minimum of Certificate 3 or above in Horticulture (Arboriculture). NMIT in Fairfield currently runs a good program, a student generally studies 1 day per week and works the remainder which provides an opportunity to learn the necessary skills at the TAFE whilst getting the essential experience out in the field. Be sure whoever does your training that all the units you require are incorporated, there is a new national training package now in place however it is being reviewed and will need significant changes due to a range of issues. this arborist training package has a new focus and there are lots of units such as 'Dogging' and operation of skid steer machinery, some recent graduates have completed training where they think they are suited to arboriculture however they haven't been trained to Fell large trees or undertake pruning. Pruning and Felling are core skills at the very heart of arboriculture. Unfortunately it's up to the student to demand that they receive the most practical units, not the units that suit the training company to deliver. What job or career options are available to an arborist? Most work for arborists is in the tree removal and tree pruning / tree services fields, there are numerous smaller companies that service the domestic market, usually structured with the Principal and 2 or 3 workers. As discussed above the tree services field is broad, one can be engaged in domestic service work, utility clearance, consulting, ecology, planting, pruning, maintaining, tree transplanting, seed collection and a range of other fields that require canopy access. Can you be an arborist in Melbourne without being a tree climber? There are some non climbing arborists, usually they are engaged in ground based tree assessments, planting and tree establishment operations and company management roles. It is also feasible to gain a broad range of experience and tree related skills working from an Elevated Work Platform (EWP). How much does an arborist get paid in Victoria? The short answer to this is that Arborists and tree industry workers get whatever they can negotiate with the employer so long as it is equal to or above the wages and conditions set out in the National Minimum Wage Order. Many Australian industries operate within an industry 'Award', there is however no award for Arboriculture. The closest award is the Gardening and Landscape Award. Some companies will establish an Enterprise Agreement, this is a set of pay rates and conditions negotiated with employees and then lodged with Fair Work Australia. All workers in Australia are covered by the Fair Work Act 2009 and the National Minimum Wage Order therefore any Award or Enterprise Agreement is underpinned by these documents, you cannot get paid less than that set out in the Minimum Wage Order. In Victoria there are 'Industry Sector Minimum Wage Orders' and the closest one that could relate to Arborists is the 'Property and Business Services' wage order. However when you look a little more closely it turns out that the Gardening Award and the Business Services Order are all simply aligned with the minimum wage! These figures are for full time employees, casuals get more but of course they don't get sick leave, holiday pay etc. What we are seeing out in the field around Melbourne is that ground crew are getting the minimum or a little more and climbers are getting on average $25 to $35 per hour. Many contract climbing arborists seem to be asking about $55 per hour (inc gst), this figure varies greatly, a good climber can demand $70 - $90 per hour, but this is very different to being an employee; contract climbing usually includes all the climbing gear and some of the rigging and chainsaws, also this work will be specialised and irregular. There is work available at the $55 level however this is not enough to sustain and grow a business. Contract climbing generally needs to be considered a temporary role or a stepping stone due to the rigors on the body.